rd47blog: "Just All To Perfect"
When you compare other Native Americans tribes history compared to the Hopi verbal history, they can't compete. That's because all other Native American tribes of North and South America, were originally Hopi. What other tribes of the Americans can say that in the beginning, 'Hopi were protected from an unseen enemy above'. 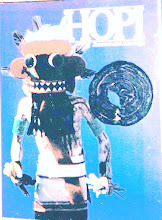 A protector that showed the Hopi where to migrate to. In the beginning years of mankind, on the surface of Mother Earth. What other Native American tribe of the Americas, have petroglyphs from Alaska to the tip of South America? 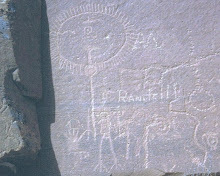 The petrogyphs alone tell that the Hopi were indeed the "Original Peoples'. The village of Orayvi (Old Oraibi) https://www.youtube.com/watch?v=FhFpb6A4SaQ&list=UUIyz-vw0nNSASjjdwMjuJnA , is the oldest continuously lived in village in America and surely South America. What other tribe can claim this? Only the Humble Hopi can say they were never forced from their original homelands. The Hopi were never genocide, by the Whites or Spaniards invaders. Hopi Ceremonies are like no others of the Americas. They are so abstract they were surely given the Hopi by their 'Creator'. Hopi Ceremonies of the 'Road of Life', are continuous throughout the year. The purpose of the continuous ceremonies, is to help maintain harmony of the Universe. 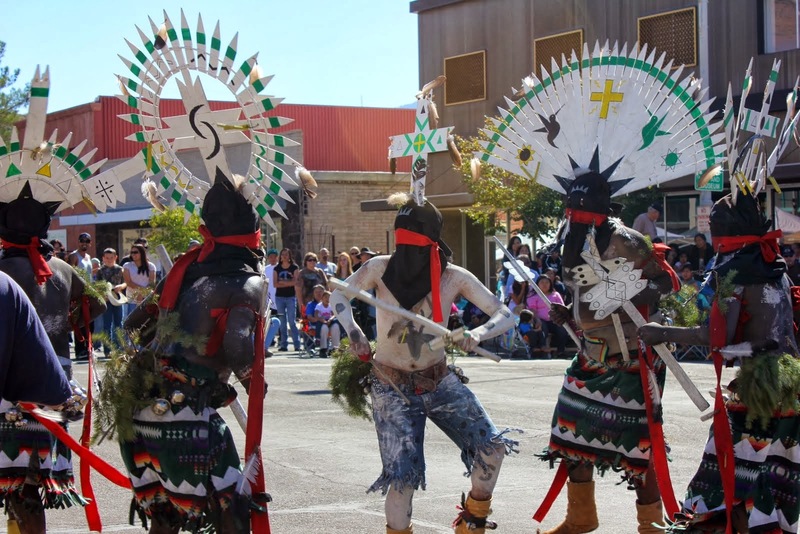 The Hopi rituals, song, dances, prayers are the most abstract and esoteric on Earth. And have been maintained over the centuries in verbal forms. The very word Hopi, means Peace. And the Hopi have no record of violence against any other tribes of the Americas. Other Native American tribes had 'Societies of War', Hopi had 'Society of Religion'. The Hopi say that they came from inside the Earth. Emerged to the surface of Mother Earth from inside the Grand Canyon. 'Hopi Emergence Tale' https://www.youtube.com/watch?v=OWg1UbbFtRc&list=UUIyz-vw0nNSASjjdwMjuJnA The Hopi tale of the Giants that roamed the surface of the Earth, fits perfect with the Nephilim of the Christian bible. Not to mention all the others who have a similar tales of the 'Giants'. In the Hopi First World 'Tokpela' (Endless Space), their was no "Time" no beginning, no ending, no shape, no life. "Taiowa the Creator" created Sotuknang to create the Living Universe. From Endless Space Sotuknang created life as it is known today. The Endless Space was created into 9 Universal Kingdoms. "Taiowa the Creator" asked Sotuknang to create life and movement to complete the First World. So Sotuknang created the first helper, her name was Kokyangwuti, Spider Women. Spider Women was instructed to bring life to the First World. Spider Women took some saliva and mixed with some Earth and molded it into, two Beings, the 'Twins' were born. The 'Twins' were instructed to keep order when life is introduced into the First World. Spider Women then created Earth trees, bushes, plants, flowers, all kinds of seed-bearers, and nut-bearers to clothe the Mother Earth. Then Spider women created the Birds and animals, molding them from the Earth. The new plants and animals all worked in harmony with each other. Life would spread to the Four Corners of Mother Earth. Sotuknang invited "Taiowa" to come see his creation, who was very pleased. Taiowa said it is now "Time" for human life. Spider Women gathered the four colors of Earth, Yellow, Red, White, and Black. Mixed the four Earth colors with her own saliva, covered them with her White-substance cape which gave the four colors of mankind wisdom itself. Then she sang over her creation, out came four human forms that resembled Sotuknang. In the Hopi Second World 'Tokpa', the inhabitants were those who survived the First World destruction. These were the Good Folks of the First World.. In the beginning of the First World, the humans and animals all lived in peace with each other, trusting one another. As "Time" moved forward, so did mankind's distance from the their Creator's instruction. Gradually the commands of Sotuknang were forgotten. First their was the Talker Lavaihoya (Mocking Bird), who spoke of the difference in the races of peoples. The differences between the animals and the peoples. Then the animals began to draw away from the people. Then came Katoya to further divide the races and animals from each other. Katoya came in the form of a Snake with large head. As mankind grew further and further from the instructions left to them, Sotuknang appeared suddenly. By this "Time" only a few were maintaining the "Creator Taiowa" Laws of Creation. Sotuknang told the humans that him and his uncle the Creator "Taiowa" had talked and that the First World must be destroyed. The Good People of the First World were saved for the Second World 'Tokpa'. All over thee World the Chosen People began to leave their homes. Following a Cloud by day and a Star by night. The sinners of the 'First World' laughed at those who saw the Cloud and Star. Those not following the 'Laws of Creation', could not see the Cloud and Star. When all the followers of the Cloud and Star arrived together in one place with Sotuknang, the 'First World' was destroyed. Sotuknang lead the Chosen Ones to a large mound where the 'Ant People' lived underground. Sotuknang instructed the 'Ant People' to let the Chosen Ones in as he destroyed the Earth. The 'Ant People' sacrificed their own to protect and feed the Chosen Peoples. While Sotuknang destroyed and rearrange the surface of Mother Earth. Sotuknang told the Chosen People to make their Emergence into the 'Second World' (Dark Midnight). In the 'Second World' mankind was not allowed the privilege of living in peace with the animals. Soon mankind was building homes, trading with each other. Soon the inhabitants of the 'Second World', were not satisfied with what they had and began to fight with each other, wanting more and more. They forgot to sing praises to their 'Creator'. Wars broke-out between villages. Still their were a few living the ways of the 'Laws of Creation', singing song to their 'Creator'. Suddenly Sotuknang appeared having heard the discord through the centers of the Earth. Sotuknang said that, 'Spider Women' said their Thread is running out on this World. Sotuknang and "Taiowa" had decided that the 'Second World' must also be destroyed. They would first wait until all the Chosen Good People could be put in a safe place. One again the Good People were put underground with the 'Ant People'. The 'Twins' were instructed to leave the place at the Poles. Thus causing the World to spin out of control, the Earth rolled over twice. This was the end of the 'Second World 'Tokpa'. The Hopi Third world 'Kuskurza', direction East, color Red. Soon the Third World was covered from end to end with people. The countries became large, the cities grew larger and larger. It was hard for the citizens of the Third World to follow their 'Creator's' ways. Mankind's reproductive powers were being used in the wrong ways. Quickly the citizens of Mother Earth became concerned with their own earthly ways. Forgetting to sing praise to "Taiowa" and Sotuknang. The Road of Life had been abandoned by the Hopi. Some Hopi used their creative powers to create Patuwvota, (shield made of hide) to fly on, to attack other cities. Soon peoples of the cities started making Patuwvotas to attack other cities. Just like in the previous other two Worlds, war had come to the Hopi. Sotuknang and Spider Women decided that the peoples of the Third World, must be killed off. Before they destroy those who still have Songs for the Creator in their hearts. Spider Women asked Sotuknang how she was to save the Good Folks? Sotuknang told Spider Women to put the Chosen Ones in hollow reeds. Spider Women place the saved ones with some water and cornmeal inside the hollow reed as instructed. Water was going to be used to destroy the Third World. The Chosen ones were tossed into the air and landed on the water. They were floating endlessly in "Time". Finally stillness feel over the reeds with the inhabitants. The water had receded and a new World had been provided for the Chosen Ones. This new home was covered by water as far as anyone could see. Birds were sent out to find dry land, but no dry land was to be found. Spider Women directed the Chosen People to make round flat boats of the hollow reeds they once occupied. They kept traveling towards the rising Sun, in their reed boats. 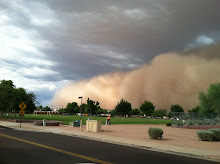 Finally they heard rumbling noise, it was landfall. Spider Women told them that this is not the place yet. The Chosen People hiked to the other side of the island they had landed on. Spider Women had them make larger boats made of reeds, told them to make paddles. They would now have to make their own way, the farther the harder. Reaching landfall, the Chosen People had all the things they needed to live on. They stayed here year after year. Spider Women reminding them that this is not the Fourth World. Life here was far to easy and the Chosen Peoples would soon fall into the same trap as those before. Once again the Chosen Peoples traveled by foot across their new home. Once there, they made reed rafts and paddles. Spider Women told the Chosen Ones that they were now on their own to find your own home. The Chosen People not knowing which way to go or do, opened the 'doors on the top of their heads' and let themselves be guided. Soon the waters smoothed out a gentle current carried them to the Fourth World. What was left behind the Chosen People, was the previous three Worlds. The Hopi Fourth World 'Tuwaqachi', World Complete. Each Clan or group was told to follow their own Star until it stopped. There they would settle. As the Chosen Peoples moved inland they heard rumbling noises again. The noise was coming from a handsome man. The Chosen Ones asked if he was the one making the noises? Yes the handsome man replied, I am here to guide you, I am Masaw, I am the caretaker, guardian and protector of the land. The Chosen Ones recognized Masaw from the Third World. He to had been acting a little to self-important and had lost his humility before the 'Creator'. Being a Spirit Masaw could not be killed off like the others in the previous three Worlds. "Taiowa" decided to give Masaw another chance as protector of the Fourth World. Masaw would not be the Chosen Peoples leader, for their plan has been laid-out by the 'Creator'. They were to continue on on their Migrations to settle Mother Earth. The people broke into Clans and began their Migrations. This is now the Fourth World, World Complete, North the direction, color yellow-white, Chiefs upon it are the trees Juniper, bird is the Owl, animal is the Mountain Lion. A more complete history would be hard to find. As all history is written by the Conquers. Just as the Catholic church did in the past, destroying all cultures they meet throughout history. The Humble Hopi have been spared from the destruction of cultures by the Catholic Church and others. Maybe it was the fact that the Hopi lived so humbly with Mother Nature that kept them safe over the millenniums. 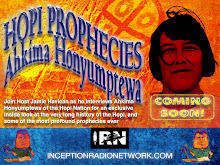 Or could it just be, 'the Humble Hopi' are the true Chosen Peoples, the First Peoples.